Recipe from the Beater Blade for Kitchen Aid ladies. 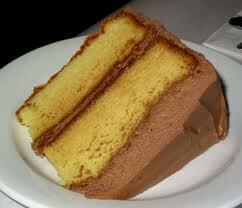 Check out their VIDEO of how to easily prepare this delicious, rich cake by Clicking Here. Hardware: Two 9-inch round cake pans greased, bottoms lined with parchment paper and then greased again and lightly floured. 1. Adjust oven rack to the middle position; preheat to 350° F. In a medium bowl lightly combine the Yolks, ¼ cup of the Milk and Vanilla; set aside. 2. In a bowl of a stand mixer, measure and add all dry ingredients. Attach BeaterBlade+ and turn mixing speed to Stir to blend, about 15 seconds. With mixer running, slowly add 1/2 the Butter in chunks, then remaining ¾ cup Milk aiming for the center of the bowl. Increase speed slightly, add the last last of the Butter and beat until dry ingredients are just moistened. Increase speed to Medium (#4-6) to aerate, about 60 seconds. Batter will form webs from the sides. 3. Reduce speed to Very Low (#2) add Egg mixture* in 3-4 batches, aiming for the center, beating to combine after each addition. Increase speed just to incorporate and strengthen the structure. Stop mixer and clean dry ingredients from BeaterBlade+ and top portion of bowl. Clean blades if necessary. Beat again to finish on Medium, about 30 seconds. You will not over beat this batter on Medium. 4. Disconnect bowl and use BeaterBlade+ as a spatula to pour equal amounts into prepared pans. Bake 25 to 35 minutes or until a cake tester inserted in the center comes out clean and the cake springs back when lightly pressed in the center. Let cakes cool in the pans on racks for 10 minutes. Loosen the sides with a metal spatula and remove cakes. Invert onto a wire rack and cool completely before wrapping airtight. * Egg mixture will spurt up and out of bowl if not added in the middle. Use a pouring device that will enable accurate placement of liquids. You will LOVE what the Beater Blade can do for your Kitchen Aid mixer! The Beater Blade has lots of stark, raving, FANS!